Today, on 21.12.2018, information was received at 12.30 pm in the District Police Control Room, that there is a possibility of some laborers being suppressed by hiking the hill above the laborers under the Allwadi Road project in Banswara. The said information was immediately flashed to the public the police station, check posts, police lines and fire service. Rescue work was started immediately without any delay by the staff of the Deputy Chief Inspector, Mr. Hoshiar Singh Pankholi, along with the officers appointed along with the Routine checking at Kasba Bhuri near nearby. In the first place, the workers were taken away from the scene by the help of locals, and the injured were taken away from the scene. In the meantime, police force reached the spot from Agasthyamuni, Guptakashi, near the nearby police station. The police lines, fire service and SDRF teams also reached the spot. 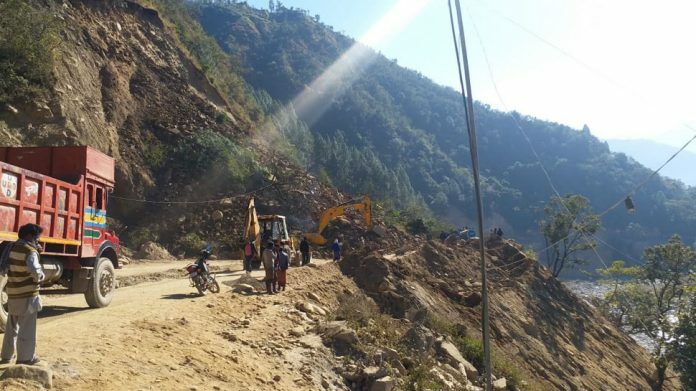 From the district headquarters, Superintendent of Police Rudraprayag Shri Ajai Singh and District Magistrate Rudraprayag also reached the spot. Through which relief rescue operations were also run. Other middle-class officers / employees also reached this center. A total of 03 wounded were taken safely during the operation carried out at war level, which were given first aid in the first hospital, Agasthyamuni. 01 person, who is a JCB driver, was discharged due to fewer injuries and other 02 persons who are seriously injured, after first treatment, after sending the Higher Center, after sending the Higher Center through Rudraprayag, lift the air through the helicopter Rishikesh has been transported. A total of 07 laborers have been recovered from rescue operations, all the deceased are residents of Baramulla, Jammu Kashmir. Whose names are being obtained. In view of the possibility of other workers being stranded, continuous rescue operations are still on the spot. In the event of the incident, the major negligence of the executive body has come up, they were being provided work without the safety standards of the workers, resulting in such a major accident, in relation to which the police investigated the necessary legal proceedings Is being implemented.